Born in 1957, Deitra Farr first heard live blues on Chicago’s legendary Maxwell Street, where her father used to take her as a little girl to be immersed in what was to be the heyday of Blues, Doo Wop, Gospel and Rock & Roll. Six decades later Deitra received the prestigious 2017 Jus’ Blues “Queen of The Blues” Award in Tunica Mississippi. Prior to that, there is a swag of accolades, not least on October 4, 2015 Deitra when was inducted into the Chicago Blues Hall of Fame as a ” Legendary Blues Artist “. Deitra Farr is considered one of Chicago ’s top vocalists, according to Living Blues Magazine (May 1997). Fiery, energetic, and soul-stirring describes this woman, who has over the years been nominated for Traditional Female Blues artist of the year by the W.C. Handy Awards, Female Blues Artist of the year by the Living Blues Critics’ Awards, the British Blues Connection Awards, and the Les Trophees France Blues awards. This Chicago native began her career in 1975, singing with local soul bands, before starting her blues career in the early 1980’s. 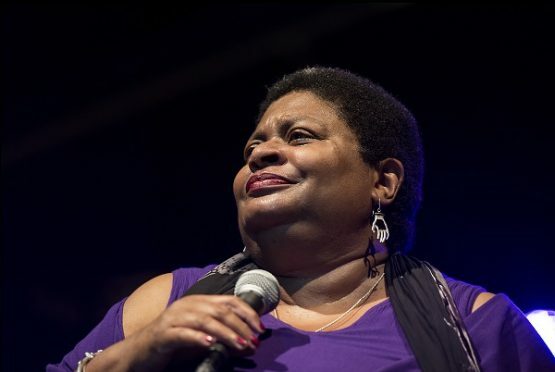 In 1983, Deitra began her blues career working at the major Chicago blues clubs, such as The Kingston Mines, The Wise Fool’s Pub and Blue Chicago. She also toured the US and Canada with the Sam Lay Blues Band. From 1993 to 1996, Deitra was the lead singer with Mississippi Heat, recording two CD’s with this all-star group. When Deitra was 18 years old, she recorded the lead vocals on Mill Street Depo’s record” You Won’t Support Me “. That record was a Cashbox Top 100 R&B hit in 1976. Over thirty years later, that recording has been re-released and is popular again worldwide. The multi-talented Deitra Farr is also a published writer, poet, songwriter, and painter. A graduate of Columbia College (Bachelor of Arts in Journalism), Deitra has recorded many of her own compositions and has written articles for the Chicago Daily Defender, The Chicago Blues Annual, and the Italian blues magazine il Blues. Currently she has a column “Artist to Artist” in Living Blues Magazine. w/ The Redeemers, better be quick!